Becker Oil-Less Pumps | VT Series Vacuum Pumps | Lewis Systems, Inc. The Becker VT series vacuum pumps are 100% oil-less and are designed to operate on a continuous basis. They have a reputation for being exceptionally quiet and are ideal for applications where oil or water is objectionable. Applications include the graphic arts, packaging, robotics and material handling. The next generation of 100% oil-less combination pressure/vacuum pumps for the graphic arts industry. 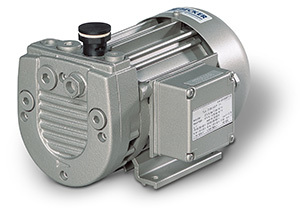 These pumps are standard equipment on many OEM products and are ideal for replacement of most other brands. Built for long life in the toughest applications on prepress, pressroom and bindery equipment, these pumps provide plenty of blast air and suction. Cooler operation minimizes static electricity build-up and built-in oversized filters remove the dust and dirt which are so common around the pressroom equipment. 100% oil-less means there is never a chance of oil in the blast air to contaminate your product.